Strengthening our capacity for successful watershed management. The 2019 Academy is now closed, with a record number of people planning to participate. Please contact Sara Peel if you have questions about enrolling in the Indiana Watershed Leadership Academy. It will improve your skills for creating a scientifically sound plan for watershed management that actively involves, engages, and is supported by your community. Web-based distance learning via participants' personal computers. Participants complete a series of online lesson modules that include readings, assignments, and discussion over a five month period. Face-to- face meetings promote networking and allow opportunities to pursue specialized topics in-depth. Each participant completes a learning project on a topic of special interest. Graduates of the Indiana Watershed Leadership Academy earn a Professional Certificate in Watershed Management. The Academy uses the eXtension Online Campus. More information will be provided for accepted applicants. How Much Time Does the Academy Involve? Participants complete a minimum of nine lesson modules, a learning project, and participation in three face-to-face class meetings. Students can expect to spend 3-4 hours on each lesson module, and 8-10 hours on their learning project. Face-to-face sessions are held at a leadership center and state park consisting of overnight and single day sessions. The registration fee is $750, which must be paid by December 17, 2018 (fee includes lodging and food for overnight and one-day workshops, plus all course materials). For more information, Jane Frankenberger,IWLA Director (Purdue University Professor and Extension Specialist, (765) 494-1194; frankenb@purdue.edu) or Sara Peel, IWLA Coordinator (iwlasub@ecn.purdue.edu; (765)337-9100). Indiana Watershed Leadership is a program of Purdue University. The program draws on expertise and resources at Purdue and collaborates with Indiana's major conservation agencies. Support was previously provided by the Indiana Department of Environmental Management through section 319 of the Clean Water Act. A diverse Steering Committee and project team representing a dozen different agencies and organizations is involved in developing and teaching the academy. Academy Class of 2006 sampling fish species in Ghost Creek (Tributary of Tippecanoe River) with Greg Bright of Commonwealth Biomonitoring. When determining acceptance to the Academy, Indiana applicants will be given priority. If space is available, out-of-state/country applicants will then be considered. 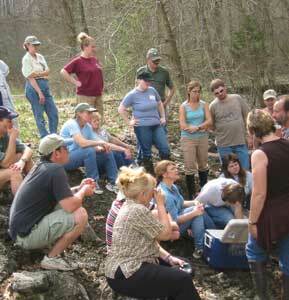 Indiana Watershed Leadership Academy is a program of Purdue University. Support is provided through a 319 Clean Water Act grant from the Indiana Department of Environmental Management. Copyright © 2016 Purdue University. EEO Statment. Contact Project Director. CSS by Andreas Viklund.